Harrington admittedly held onto the ball longer than in previous years the past two years when he was almost never sacked. I remember that Kearse also got at least one of those sacks on Backus. There is no shame in giving up a sack to Kearse, they're not the first, and won't be the last. Comparatively speaking, McDougle is pretty good, and is needed at the right price. He's probably looking for a top offer, and will have a hard time getting one. There aren't a lot of good right tackles available in Free Agency or the draft. Kearse had all three sacks against McDougle, I remember discussing it online with several people. He had a pass knockdown against Backus and some pressures. Jevon spent most of that game playing LDE. And Philly was just one game. McDougle has been a model of inconsistency since he was moved to tackle. If his asking price is reasonable, then they can go ahead and re-sign him, but they should still move him inside to guard. But I've heard he wants big money and a change of scenery. As for saying that there are no tackles available better than McDougle, we can disagree on that. I feel there are several that would be better than Stocker. Barron, Brown, Colmer, and Adam Terry are all more consistent and will be better pros than Stockar. Right tackle isn't a position that is keeping the Lions from winning football games. They're pretty solid there, they have much more important issues to address, such as safety, left guard (he's not a guard IMO), and perhaps TE. Why create a problem that isn't there? I think the idea of drafting OT is for that player to be a LT not RT. 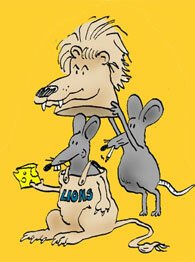 Which is why I think if the Lions would look Barron first. But many believe Brown has the talent to be LT also. Backus seems better suited for RT or guard duty. The OL is a reason the Lions are not winning games. Why do you think it's 3rd and 3 and the Lions have to pass the ball in order to pick up a first down? This line gets not push what-so-ever and the pass blocker seems to break down all the time also. McDougle has been inconsistent and injury prone which is why the Lions will look elsewhere. Besides he's not one of Millen's guys so he's not going to be cut any slack. Last edited by Leo on January 23rd, 2005, 1:31 pm, edited 1 time in total. Davis might be similar in size to Taylor but he is not the fulid athele nor does he have the speed or coverage abiltity. If anything he?s sounds like an upgraded version of James "Dirty" Davis coming out of college. The Lions already have a first round drafted LT in Backus. Pass protection isn't a problem for the Lions, neither is run blocking. Not for them to waste a premium first round pick on. Every team passes on 3d down and 3; they always have and always will. The Lions have given up the fewest sacks in the NFL the past 3 seasons combined. And how did this go from the draft to McDougal? I would rather see him go. cruzer said it himself, he'll be looking for top price, and probably won't get it. There is a reason for that, none of the pro's think he's worth it either, it's not just the fans. If the Lions draft one of the available D.E.' s, especially Pollack with the 10th overall pick, I'll be sick to my stomach. None of them are worth it. Look at last years draft and ask yourself, "Would any of these players be in the top 10?" For me....NO. Look at the talent that is supposed to be available next year. This is a very weak draft year. The Lions are finally in a position where they need to address very specific needs, not just needing help across the board and the opinion shared by most is that they are guard and safety. I don't see anyone worth a top 10 pick at those positions. I liked the idea that Mike's article gave me. Trade down with Carolina, acquire another 3rd round selection, and draft Heath Miller. Carolina then trades up and gets Alex Barron before San Diego and Houston. If Miller isn't there, we can take Thomas Davis. If not, then a defensive end. Sounds like a plan! I like your plan. Sounds better than any other option discussed so far. So Carolina is looking to trade up? What player are they targeting? If he's worth drafting at #10 who is he? It's is to say trade down but you just can't count on it. Ask Millen about it. The OL is a major problem and not just at the guard position. I believe a guard will be signed in Free Agency which another reason why I believe McDougle will be gone. It's cheaper to sign a guard than a tackle. Backus coming out college was considered a candidate for guard or RT. The only reason he's playing LT is the LIons don't have anybody else. I just don't see any improvment from his rookie year. The Lions really need to consider upgrading that position and move Backus to a less demanding position. One more thing the pass blocking is not that good Joey is really good at throwing the ball away early. Or bad at it depending on how you look at it. Teams rush only 4 linemen and they still can get the QB before anybody gets open. Right now (before free agency, which can change needs big time); I'd prefer Thomas Davis in the first round. Whether the Lions can trade down and still get him is another question. Is Miller worth that high of a pick? I don't think so. But he's really the only starter quality TE in this draft. If Davis is there at 10; right now I'm taking him, not thinking about a chance in losing him. I think he's a special player, probably the best defensive player in this draft overall IMO. Plan and simple, we have used the last 4 first round draft picks over the last 3 years on offensive players, its time to pick up some D. A TE would help in the middle with everyone worrying about Rogers & Williams, but come on, we need a Safety. If we can't get one in free-agency that is worth a damn, we need to get one 1st. What do ya think? your thoughts concerning the Lions' needs are right, but you also have to see the problem that there is no first-round Safety in this year's draft. Except Davis, possibly, but many see his pro future rather at LB and his weaknesses are said to be coverage and speed. What we need is a speedy Safety who improves our coverage. Got the message? Davis is a dominating safety who's too good to waste at LB. He's a dominating type player who's perfectly suited for what the Lions need; a dominating "in the box" physical safety who's a deterrent toward running attacks. He's also very good in coverage. Georgia employed strict man coverage, often he'd be near the line of scrimmage covering RB's. He's fierce, one of the best players in the entire draft.